Have you ever decided to make tacos at the last minute and realized you didn’t have any tortillas? Well this happened to me once and I decided to make them. Most people have all of the ingredients on hand with the exception of lard, but you can substitute butter if you need to. 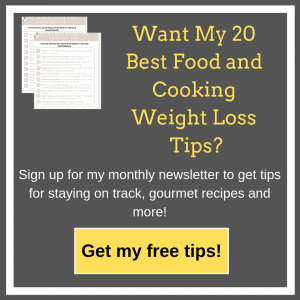 After I made them once, I realized how easy and how much better they taste. I no longer buy them anymore. 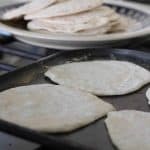 Homemade tortillas taste the best and are so simple to make! You can choose how big you want them, this recipe makes 32 tortillas which are about 5 1/2 inches in diameter and work out to be 2 smart points a piece. Or you can divide the dough into 21 balls (1.5 oz each) for 3 smart points or 16 balls (2 oz each) which work out to be 4 smart points a piece for a larger tortilla. I recommend the medium or large size for wraps. In a food processor, pulse all ingredients except the boiling water until the lard resembles cornmeal. With the food processor running, slowly add the boiling water and process until the mixture forms a dough. Knead the dough on a floured board a few times until smooth and elastic. Decide what size of tortillas you want to make: If you want small ones, then divide the dough into 32 balls. You can use a scale and weigh them at 1 oz each. Medium ones (best for wraps) divide the dough into about 22 balls or 1 1/2 oz each. For large tortillas divide the dough into 16 balls or 2 oz each. Since I really try to keep things even so I know the exact smart points, I weigh each one, it actually goes pretty quickly. To make the most of my time after I divide the dough into the balls, I turn on my non stick griddle pan on medium high heat. While it’s heating up, I roll each ball into a 5 1/2 inch diameter circle for small tortilla or a little larger if you’re doing a larger tortilla. Try to make them as thin as you can. 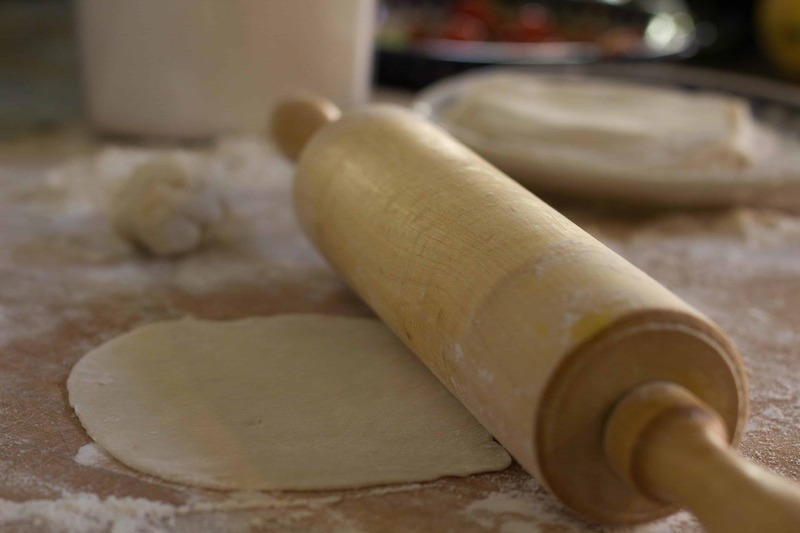 I do one stroke with the rolling pin, then turn tortilla over and roll again. If you do roll, turn 1/4, roll, turn 1/4 your tortillas will come out somewhat round. I roll about 1/2 the balls into tortillas and then start cooking. Cover dough and balls as you go so they don’t dry out. Make sure your pan or griddle is hot before you start. My griddle pan will hold 4 tortillas at one time so I place them on the pan (no oil needed), then I go back to rolling out more balls. When the dough begins to bubble (after about 30 sec) I flip them over and cook for another 15 seconds or until lightly browned. So I roll and cook at the same time, it makes things go faster. All in all I can make 32 small tortillas, 21 medium tortillas or 16 large tortillas in about 30-45 min. Be sure to cover them after you cook them, otherwise they will dry out. I place them on a dinner-size plate, cover with a piece of parchment and then a kitchen towel. If you cover them just with the towel, they might taste like fabric softener from the towel (believe me, it’s a yucky taste). When they are all cooked, transfer them to 2 large plastic bags with parchment in between each one and freeze. Pull one out whenever you need one, wrap in a paper towel and microwave for 20 seconds or place directly on a skillet and reheat until hot. If it is a warm day, you will want to put parchment paper in between the uncooked tortillas otherwise they might stick together. Be sure and keep the balls and the tortillas covered with a towel while you work or they will dry out. Cooked tortillas will last about 2-3 days on the counter in a plastic bag or you can put them in the refrigerator up to a week. You can also freeze the cooked tortillas, be sure and put parchment paper in between before you freeze them. Pull out as needed.